Background: Muscle strength is necessary for upper body normal function. Upper extremity function impairments have been reported in breast cancer (BC) survivors. It is not possible to know precisely if cancer adjuvant therapy such as radiation and chemotherapy had any effect on the unaffected arm. The aim of this study was to compare shoulder girdle strength among women with BC and similarly aged women without cancer. Materials and Methods: Thirty-three postmenopausal women (51 ± 6.46 years) with BC who underwent surgery, chemotherapy, and radiation therapy and 30 healthy postmenopausal women (53.26 ± 5.05 years) were selected. Muscle strength was measured using a handheld dynamometer for flexion, horizontal adduction, internal and external rotation, scapular abduction and upward rotation, scapular depression, and adduction. Data were analyzed by multivariate analysis of variance (P < 0.05). Results: The findings indicated significant differences between groups of 6 of the shoulder girdle strength measure (flexion (P = 0.003), internal rotation (P = 0.001), external rotation (P = 0.040), scapular abduction and upward rotation (P = 0.001), scapular depression and adduction (P = 0.025), and shoulder horizontal adduction (P = 0.00)). Patients showed significantly lower strength compared with healthy controls (flexion = 34.3%, abd = 64.2%, int.rot = 51.2%, ext.rot = 32.4%, hor.add = 58.06, and depression = 35.2%). Conclusion: The results indicate that the shoulder girdle strength in women with BC decreased compared with healthy women without BC. Therefore, during the treatment of patients with BC, designing of training programs and rehabilitation programs need to be performed on shoulder girdle strength factors in patients undergoing mastectomy with axillary surgery and radiation therapy. Background: Acute kidney injury (AKI) can happen due to different factors such as anemia. Packed cell (PC) transfusion is an important cause of AKI occurrence. The aim of the study is to investigate whether appropriate blood component (BC) therapy can reduce blood transfusion and it would result in AKI decreasing. Materials and Methods: We conducted a cohort study of 1388 patients who underwent cardiac surgery in one university hospital. A serum creatinine higher than 2 mg/dl, renal disease history, renal replacement therapy (chronic dialysis) were our exclusion criteria. Results: from our 1088 samples, 701 (64.43%) patients had normal kidney function, 277 (25.45%) were in the AKI-1 group, 84 (7.72%) had an AKI-2 function, and the rest of patients were classified as end stage. A mean of more than three PC units were transfused for the second and third stage of AKI, which was significantly higher than other AKI groups (P = 0.009); this higher demand of blood product was also true about the fresh frozen plasma, platelet, and fibrinogen. 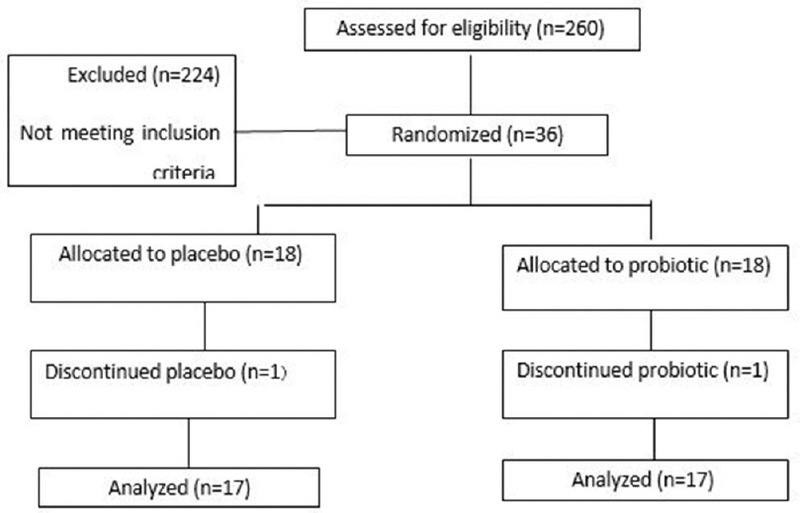 However, there were no needs of fibrinogen in the patients with normal kidney function. The cardiopulmonary bypass time had an average of 142 ± 24.12, which obviously was higher than other groups (P = 0.032). Total mortality rate was 14 out of 1088 (1.28%), and expiration among the AKI stages 2 and 3 was meaningfully (P = 0.001) more than the other groups. Conclusion: A more occurrence of AKI reported for the patients who have taken more units of blood. However, BC indicated to be safer for compensating blood loss because of low AKI occurrence among our patients. 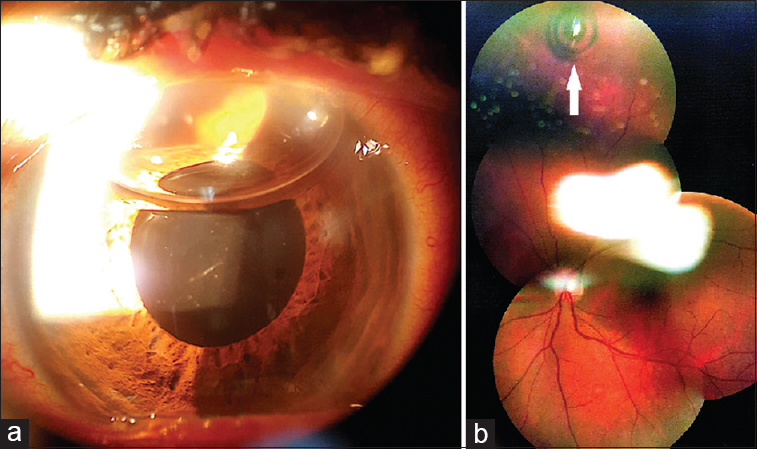 Letter to Editor: Noting a black ring at bending: A postcataract surgery symptom! Background: Early upper gastrointestinal (UGI) cancer detection had led to organ-preserving endoscopic therapy. Endoscopy is a suitable method of early diagnosis of UGI malignancies. In Iran, exclusion of malignancy is the most important indication for endoscopy. This study is designed to see whether using alarm symptoms can predict the risk of cancer in patients. Materials and Methods: A total of 3414 patients referred to a tertiary gastrointestinal (GI) clinic in Isfahan, Iran, from 2009 to 2016 with dyspepsia, gastroesophageal reflux disease (GERD), and alarm symptoms, such as weight loss, dysphagia, GI bleeding, vomiting, positive familial history for cancer, and anorexia. Each patient had been underwent UGI endoscopy and patient data, including histology results, had been collected in the computer. We used logistic regression models to estimate the diagnostic accuracy of each alarm symptoms. Results: A total of 3414 patients with alarm symptoms entered in this study, of whom 72 (2.1%) had an UGI malignancy. According to the logistic regression model, dysphagia (P < 0.001) and weight loss (P < 0.001) were found to be significant positive predictive factors for malignancy. Furthermore, males were in a significantly higher risk of developing UGI malignancy. 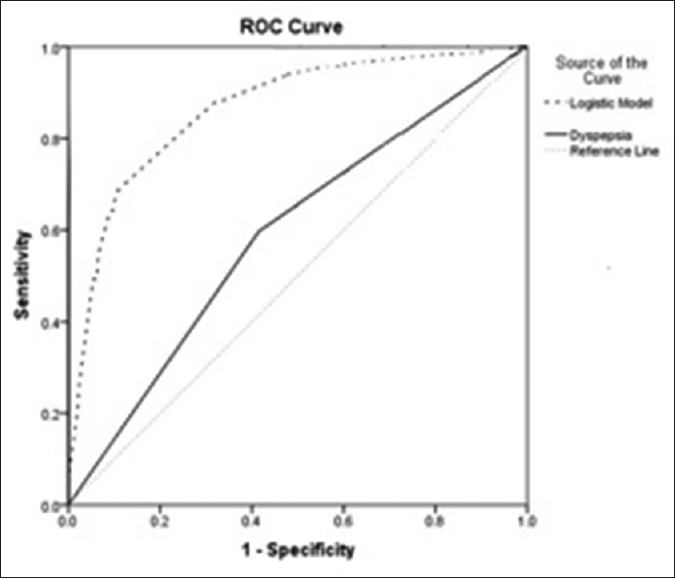 Through receiver operating characteristic curve and the area under the curve (AUC) with adequate overall calibration and model fit measures, dysphagia and weight loss as a related cancer predictor had a high diagnostic accuracy (accuracy = 0. 72, AUC = 0. 881). Using a combination of age, alarm symptoms will lead to high positive predictive value for cancer. Conclusion: We recommend to do an early endoscopy for any patient with UGI symptoms and to take multiple biopsies from any rudeness or suspicious lesion, especially for male gender older than 50, dysphagia, or weight loss. Background: There is interest about the role of platelet (PLT) number and function in nonalcoholic fatty liver disease (NAFLD). NAFLD patients have abnormalities of PLT number and function, especially mean platelet volume (MPV) which is known as a novel biomarker for atherosclerosis. We decided to compare PLT number and function between NAFLD and healthy participants. Materials and Methods: In this case–control study, two groups of patients (65 cases with NAFLD and 65 cases without NAFLD) were included consecutively. The diagnosis of NAFLD was made using ultrasound examination of the liver. Venous blood samples were taken, and the required laboratory markers including PLT number and function (MPV, platelet distribution width [PDW]), prothrombin time (PT), partial thromboplastin time (PTT), lipid profile, hepatic transaminases, ferritin, and fasting blood sugar were assayed. Results: Mean (± standard deviation [SD]) MPV in NAFLD group (10.29 ± 0.95 fL) was significantly higher than in control group (9.56 ± 1.18 fL); P < 0.001. No significant difference was observed regarding mean (± SD) PLT count between NAFLD (271.20 ± 52.11 × 103/mm3) and healthy participants (262.86 ± 75.81 × 103/mm3) (P = 0.46). Mean (± SD) PDW values were not significantly different between NAFLD and control groups. Logistic regression showed that NAFLD was positively associated with higher MPV (odds ratio [OR] =1.9, 95% confidence interval [CI] =1.20–3.02) and body mass index (OR = 1.5, 95% CI = 1.05–2.15) values. However, PT (OR = 0.14, 95% CI = 0.02–0.82) and PTT (OR = 0.72, 95% CI = 0.58–0.88) had negative association with NAFLD. Conclusion: Higher MPV was found to be significantly associated with NAFLD. However, such significant association was not detected regarding PLT count or PDW. As MPV is a reported risk factor for atherosclerosis, this marker may be useful in follow-up of patients with NAFLD. These findings provide basis for further studies to address this marker in long-term follow-up of NAFLD patients. Background: One of the most common operations in the plastic surgery curse is abdominoplasty. Several methods were recommended for achieving better results. In the present study, efficacy of a new method compared with classical high lateral tension on preventing dog ear and elongation scar was evaluated. 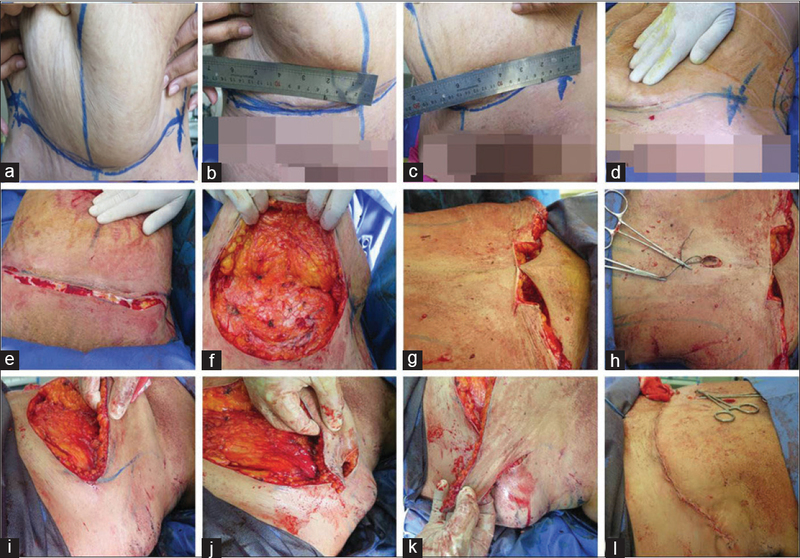 Materials and Methods: in an open-label, randomized clinical trial, seventy patients who were candidates for abdominoplasty were selected and randomly divided into two groups. The first group was operated by classic high lateral method and the second group was operated by a new method concentrating on changing incision line and angle. Dog ear prevention, length of scar, improvement, and postoperative complications were compared between the two groups. Results: The mean ± standard deviation (SD) length of scar in treated patients with classical and new abdominoplasty surgical methods was 53.68 ± 6.34 and 41.71 ± 1.78 cm, respectively, and the length of scar in the group treated with the new method was significantly shorter (P < 0.001). The mean ± SD distance between two anterior superior iliac spine in group treated by new method was significantly decreased after surgery (31.3 ± 1.3 cm) compared to before intervention (36.7 ± 3.9 cm) (P < 0.01). Conclusion: The new method is more likely to be successful in patients with high lateral tension abdominoplasty. However, according to the lack of similar studies in this regard and the fact that this method was introduced for the first time, it is recommended that further studies in this area are needed and patients in term of complications after surgery need a longer period of follow-up. Background: Irritable bowel syndrome (IBS) is assumed as one of the most frequent gastrointestinal disorders, which decreases the patient's quality of life. IBS pathogenesis, however, is not clearly defined. It seems that sleep apnea induces or escalates IBS clinical symptoms. This study aims at evaluating of IBS prevalence in patients, who are afflicted or are not afflicted with sleep apnea. Materials and Methods: This was a case–control study, which was implemented in a sleep laboratory located in Isfahan, Iran. We recruited 200 patients being more than 15 years from 2014 to 2015. Based on the apnea–hypopnea index (AHI), we recruited 100 patients in each of two groups: negative sleep apnea (NSA) (AHI ≤4) and positive sleep apnea (PSA) (AHI >4). IBS was diagnosed through a Rome III diagnostic questionnaire. Results: Overall, the prevalence of IBS among patients referred to sleep laboratory was 17.6%. Indeed, IBS prevalence in NSA and PSA groups were 8.2% and 27.1%, respectively. Furthermore, odds ratio of IBS in PSA group versus NSA was 3.92 (95% confidence interval = 1.58–9.77, P = 0.003). Our results showed that the prevalence of IBS did not differ significantly between various severity of sleep apnea (P = 0.452). Conclusion: This study showed that there was a positive association between sleep apnea and IBS. Background: This study was aimed to determine frequency and antimicrobial susceptibility of Community-acquired methicillin-resistant Staphylococcus aureus (CA-MRSA) among colonized patients in outpatient status. Materials and Methods: A total of 2000 nasal nares specimens were collected and inoculated on mannitol salt agar. MRSAs were identified based on mannitol positivity and coagulase test followed by cefoxitin disc diffusion test. Antimicrobial susceptibility of MRSA isolates was performed by E-test method for vancomycin and doxycycline as well as disc diffusion method for sulfamethoxazole-trimethoprim (SMX-TMP), erythromycin, linezolid, and clindamycin. D-test was performed for detection of inducible resistance to clindamycin. Results: Overall, nasal carrier rate of S. aureus and CA-MRSA was estimated 22% and 1.25%, respectively. Out of the 440 S. aureus isolates, 25 isolates were MRSA. All were susceptible to vancomycin and linezolid, and susceptibility rates to SMX-TMP, erythromycin, levofloxacin, doxycycline, and clindamycin were 68%, 44%, 48%, 40% and 44%, respectively; furthermore, 28.5% of resistant isolates to erythromycin had inducible resistance to clindamycin. Conclusion: It seems susceptibility to clindamycin and SMX-TMP, recommended agents for empirical treatment of suspected CA-MRSA, are not promising. Vancomycin and linezolid are effective and reliable antibiotics for the treatment of S. aureus infections.